When damp heat is present within the bladder, the internal environment is opportune to developing urinary infections, bladder crystals, obstructions and stones. The herbs in Herbsmith Dianthus Harmonize Bladder drain damp heat, promote urination, and resolve obstructions helping to provide a proper urinary environment. Like all Herbsmith herbal blends, Herbsmith Dianthus Harmonize Bladder has been used for years in the clinic and been helpful in resolving the underlying environment of urinary dysfunction in cats and dogs. 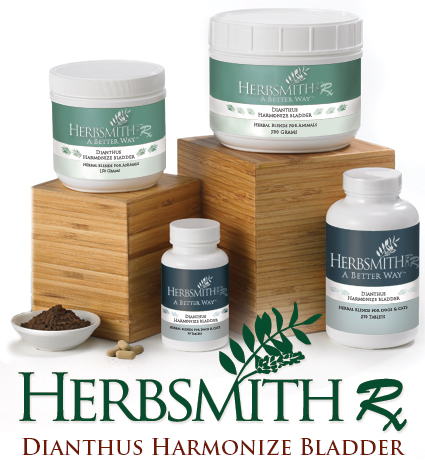 The herbs used in Herbsmith Dianthus Harmonize Bladder drain damp heat, promotes urination, and resolve obstructions helping to provide a proper urinary environment. Herbs provide a simple, easy resolution to a life long issue.